The samples that are lost their natural structure during collection process are called disturbed sample. The only information that can be determined form this sample are mineral content and composition of soil. The index properties like specific gravity, grain size and plasticity characteristics can be determined from such sample. The samples that retains its natural water content and structure of soil are known as undisturbed samples. It is a theoretical term as some disturbance is unavoidable. If all condition meets during collection of samples from bore hole, during removal of this sample produces change in stress as conditions and get disturbed. The small the disturbance, the more reliability of results. The engineering properties of soil that are most important for design of foundation are strength, permeability and compressibility. Undisturbed samples of cohesive soils can be collected with relatively less difficulty and fairly accurate evaluation of these properties can be obtained by laboratory tests. Undisturbed samples of most rock can easily be obtained; but it is almost impossible to collect an appropriate undisturbed and when the term undisturbed is used, it refers to a sample that are collected with some precautions to reduce disturbance of soil skeleton that exist before boring or sampling. In this regard, undisturbed sample collected by different laboratories may have wide variations. • No change in chemical properties of constituents. • A sample is always remain under a confining pressure. When it is taken out from its original position, the confining pressure is removed or unloaded which result some unknown degree of expansion. In case of in-situ testing, the lateral expansion along the side of boreholes will results error when calculation is based on hole diameter, with unknown amount of disturbance. • Except samples collected from test pit, are disturbed with volume displacement by the tube or other devices used for collection; this disturbance is further increased when gravel exist along depth of borehole. • Sample friction along the sides of collection tube results compression of sample during its recovery. Most collection tubes are given shape to decrease side friction by maintaining smaller cutting edge than side diameter of tube. • Uncertain variation of water content of the sample may occur depending on method of recovery and availability of water around borehole or in the ground. • Reduction of hydrostatic pressure may result voids generated by gas bubble in the sample. • There have more or less disturbance while handling and transferring sample from site to the laboratory and removing sample from sampler or testing device. • The workmanship and technical knowhow of drilling operators, supervising engineer and laboratory technicians may also influence sample quality. • In extreme weather condition, may be cold or very hot days, sample may be freezed or dehydrated if not protected well on site. Moreover, temperament of worker may deteriorate in extreme temperature. It is almost impossible to collect undisturbed sample of cohesionless soil for the purpose of strength testing. Sample having minimum disturbance can only be obtained by extreme difficulty. • Together with large apparent volume of sample, due to inclusion of pieces of gravel during progress of cutting edge. This two tests will produce fairly good results. For a known volume of sampler, weight of soil contained in it yields a reasonable value of unit weight though sample may have disturbance during transporting from site to laboratory. Many attempts were made to transfer such sample for sampling tube to testing machine with least disturbance for strength test with less success. Cohesionless samples can be collected by using freezing method; some successful samplings were reported from different projects. In this technique cohesionless materials around sample are freezed except sample. The Canadian liquefaction experiment (CANLEX) project has used this method successfully; they used liquid nitrogen to freeze column of sand deposit and dry coring was conducted with CRRLL barrel, here they were freezed ground and sample itself. • geometrical arrangement of freezing system. Hofmann (1997) has provided outline of general effects of above factors. Mineralogy of fines and grain size distribution of soil defines ability to conduct an effective ground freezing and minimum disturbance during sampling in respect of void ratio and fabric structure of soil. Sample rebuilt is a technique where sample is built at the in-situ weight. Such sample lacks natural anisotropy and cementation which are very important factors for determination of permeability and strength for soil deposits. Some geotechnical engineers believe that anisotropic samples in the laboratory can be built having identical property of in-situ state and some natural cementation can be achieved in aged sample. A concluding remarks about sampling of cohesionless soil can be made that as it is almost impossible to collect undisturbed sample from this soil, strength, density and compressibility are suggested to determine from penetration tests or similar other in-situ tests. Permeability of this soil can be determined by well pumping tests; an approximate value can be found from bailing out of borehole and monitoring the time taken to raise water level up to certain level. When soft layers are found during field boring, samples of cohesive soils are collected. As geotechnical properties of these deposits may have control over selection and design of foundation, undisturbed samples are collected to have greater confidence on laboratory strength. How are undisturbed samples collected? It is relatively easy to collected samples having least disturbance in this soil. Undisturbed samples of cohesive soils are recovered by introducing specially devised thin-walled steel tubing without welded connection (seamless tubing) instead of split spoon sampler on drill rod. It is expected to push the sampler to minimize disturbance but sometimes it is driven up to the entire length of tube into the soil. Finally this tube is rotated slightly to cut off the sample or an especial cutting device can be used previously fixed with sampler. Friction keeps the sample into the sampling tube during withdrawal of sample. Especial piston or valve arrangement can be used that produce differential pressure (suction) to hold the sample into the tube. • Side friction between soil and inside surface of tube generated during forcing the soil into the sampler. These two factors are interconnected to each other; to decrease side friction too long sample cannot be collected without providing least disturbance. If a site is suspected to be troublesome, often it is desired to collect continuous samples. These requirements cannot be practically solved by usual sampler; as an example to pick a continuous sample after reaching length of sampler, the drill rod need to be taken out of borehole and a new tube have to attached to it. To overcome this limitation foil sampler are introduced which was developed by Kjellman et al. in 1948; also known as Swedish Foil sampler. Foil sampler offers us infinite opportunity to collect continuous samples. Undisturbed core of cohesive soils of unlimited length can be collected; as an example, in Tingstad Tunnel project in Gothenburg (1967) a soil of core of 90m length was collected. Two main deficiencies stated above are overcome by using this sampler. Foil sampler is a modified piston sampler. During collection of long sample, friction between soil and sampler itself will produce significant disturbance which is solved by using foils rolled off while progress of sampling. In addition to these swelling of sample core is permitted to some extent by providing inside clearance. Desired length of sample, required for laboratory tests can be cut out from the core and also can be trimmed to required diameter. This sampler can also successfully applied to frictional soils. Continuous sample is particularly required when thin silt and sand is encountered and need to be recovered. Delft continuous sampler (developed by Begemann, 1971) can also be used to collect continues samples where the aluminum foil is replace by nylon stocking of desired length, otherwise the working principle is similar. Some engineer claimed that delft continuous sampler yields better sampler than Swedish foil sampler at a lower cost. Other than these, sample disturbance depends on area ration Ar and recovery ratio Lr. These two parameters depend on diameter and length of tube. Though we are discussing about thin walled sampler, there have some difference between inside and outside diameter and have some friction at any cases. This ratio is used to determine degree of disturbance of rock core and cohesive soil sample. This ratio defines that theoretically the sample is not compressed due to friction with the tube. A recovery ratio of sample is 1 when actual length of sample recovered is equal to the distance up to which which the sample is forced to penetrate into the stratum. A recovery ratio is more than 1.0 indicates rearrangement within sample die to presence of roots, stones, relief of preloading or any other factors; the rearrangement always produce looseness in sample. This is the ratio of volume of soil displaced by sample to volume of sample actually collected. A well-designed sampler should have tube having an area ratio of less than 10 percent to recover a good quality undisturbed sample. 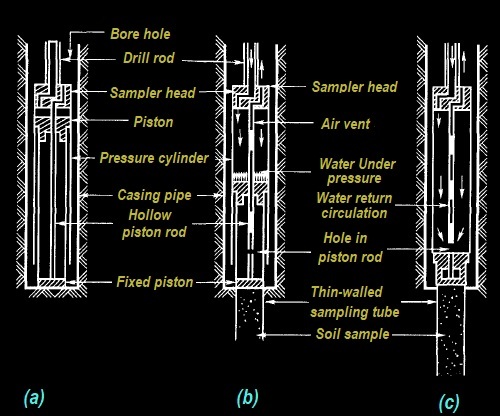 Sampler is placed on the bottom level of borehole before commencement of operation, then pushed into soil and sample enters into tube. There have 16 foil strips into the tube (strips are 1 mm thick having width of 13 mm) to carry the sample up to the tube. Compressive stress in the sample is reduced by friction between foils and soil while the length of sample recovered increases in tube. When explored soil is very soft or it is found in previous experience that in-situ tests are more reliable and required testing facility is available only a few undisturbed samples are taken for consolidation tests. General guideline to collect tube samples for consolidation tests are it should have diameter 12 mm larger than consolidating ring to allow one to trim out disturbed perimeter. It is common practice to collect a 76 mm sample to be set under a consolidometer of 64 mm diameter. Sometimes a 51 mm diameter sample is collected to be used in 48 mm diameter consolidometer. But in these type of soils such a small diameter sample is not recommended. Sometimes sampler more than 76 mm diameter can be used, but it should keep in mind that a sampler having diameter more than 100 mm may often charged more for extra effort for drilling and cost of tube, especially when stainless steel tube samplers are used (for rust control). Ordinary tube made of steel rust rapidly which will result great difficulty in extrusion of sample. According to ASTM D158, when sample is required to remain in tube for more than 3 days protective coating should be provided to inside wall.